Oudtshoorn is the main town of the Little Karoo and is best known for the ostrich feathers and products that come from this small, but productive region. There was a feather boom from 1865 to 1870, and again from 1900 to 1914; and these brought influxes of those in search of their fortunes, establishing what is today a vibrant town and farming community. 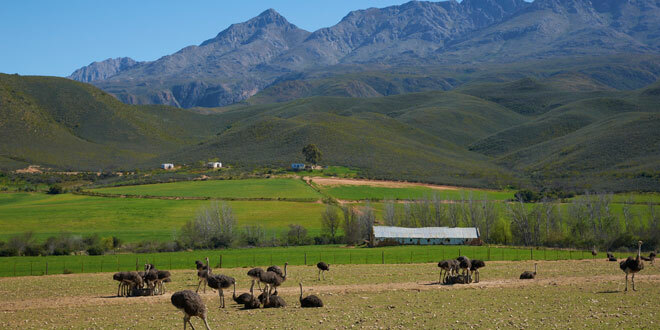 In fact, even modern-day Oudtshoorn relies on the ostrich industry as its major source of income. Visitors are assured of excellent shopping opportunities and can look out for ostrich leather products (such as bags, wallets, belts and shoes), meat (this lean meat is known for its delicious beefy flavour), feather products (ornaments, dusters, clothing and accessories), and eggs (used for eating or as ornately decorated ornaments). Oudtshoorn is also in the heart of the Karoo’s wine country and is the starting point for the Route 62 Wine Route. This area is particularly loved for the excellent ports that are produced here. A number of wine estates are within close proximity to Oudtshoorn. Wine tastings and tours are on offer at all of these and provide fabulous ways to meet the local wine-makers and get insights into their craft. There are many walking and hiking trails through the Outeniqua and Swartberg mountains. These vary in length and difficulty; so some are better for experienced hikers that want to tackle a trail that takes a few days in the gorgeous landscapes, while others are short and more manageable. The Swartberg Trail covers 52 kilometres, covered over five days, while there are several trails at Gamkaberg Nature Reserve that take anywhere between 20 minutes and six hours to complete. 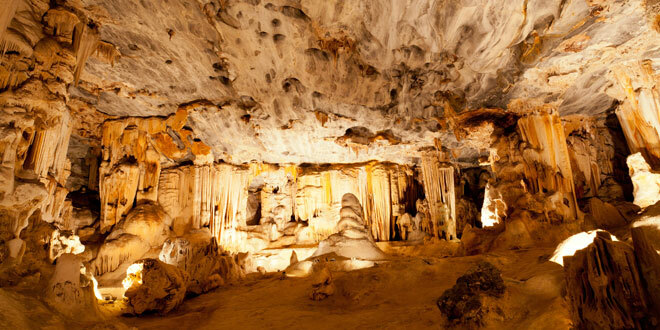 The Cango Caves are, undoubtedly, one of Oudtshoorn’s best known attractions and natural wonders. These limestone caves date back to the Middle Stone Ages and boast massive halls and caverns, impressive stalactites and stalagmites, and exciting corridors and tunnels to explore. These are the only show caves on the African continent, and cunning lighting has been used to weave tales into the unique formations, creating a magical underground world for young and old alike. Various tours are conducted through the caves, including the Adventure Tour, which means climbing steep rock faces and crawling through narrow passages. The Cango Wildlife Ranch and Conservation Area – go crocodile cage diving, or interact with cheetahs, servals, snakes, and lemurs. A host of incredible animals are found here. In addition, explore the Kuranda Forest (brimming with colourful parrots and gorgeous marmosets), Lemur Falls, Wallaby Walkabout, and more. Ma Betty’s Xhosa Cultural Village – enjoy the song and dance of local Xhosa folk, sample traditional food, hear the tales carried down over the generations and visit an authentic hut for a real taste of the South African culture and heritage. See the breath-taking scenery of the Robertson Pass, which connects Oudtshoorn to Mossel Bay (on the Garden Route). Some of the wine farms in the Little Karoo include Axe Hill (Calitzdorp), Barrydale Cellar (Barrydale), Excelsior Vlakteplaas (De Rust), Grundheim Wines (Oudtshoorn) and Bergwater Wines (Prince Albert). Kammanassie Nature Reserve – famous for its rare butterflies and spectacular views.